Cumberland Falls Bed & Breakfast has teamed up with Hike Bike Kayak Asheville to bring you the ultimate adventure package. 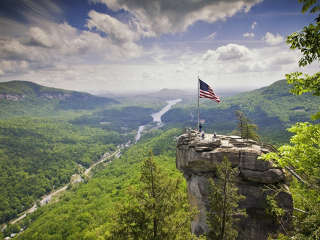 This package includes a 2 night stay (double occupancy) at Cumberland Falls and a private full day tour with Hike Bike Kayak Asheville that includes hiking at Chimney Rock and kayaking at Lake Lure. Tour starts right after breakfast at 10:15 am and ends back at the inn at 5pm. We will even throw in a picnic lunch. All transfers included. Book 2 nights at our best available rate and upgrade to the adventure package for just $200! Memorial Day through Labor Day. Subject to availability.